This name means Son of Maud, Matthew's son. Madison is a popular female given name in the United States. From a practically non-existent girl's name before 1985, Madison rose to being the second most popular name given to female babies in 2001. Originally Madison was only used as a surname, a variant of Mathieson meaning son of Matthew, although occasionally standing for son of Maddy, where Maddy is a pet form of “Maud” linked to the Germanic root: “mahthildis”. 1) “maud”, mighty in battle, strong in combat. The name derives from Old High German name “Mahthilt”, composed of two Ancient Germanic elements: “*mahti” (might, power, ability) and “*hildio” (battle, fight). 2) “Matthew” gift of the Lord, gift of Yahweh, gift of Jehovah. 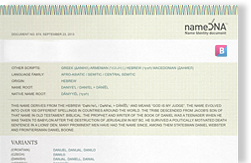 This is a given name that ultimately comes from the Hebrew name mattithyâh / mattithyâhû. It was first named to Saint Matthew, who was one of the twelve disciples of Jesus in Christian Theology, and is the author of the Gospel of Matthew.